The FireAPI™ SDK provides software developers with all the tools they need for developing and debugging any 1394 application in the Windows environment. 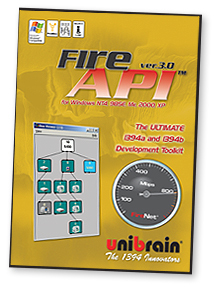 It is based on Unibrain`s 1394 Stack Technology (ubCore™), the next generation of innovative 1394a (Firewire-400) and 1394b (Firewire-800) driver suite for the Windows platform. Moreover, it is the only 1394 SDK providing a complete User Mode interface to the developer and a collection of diagnostic utilities.